A mammogram is a low-dose x-ray picture of the breast. Mammograms can show the tumors before they become enlarge to feel. For women who are older than 20 are advised by their physician to have their mammograms every year. How a mammography is done? A woman stands in front of a mammography machine, and one of her breasts is placed on a clear plastic plate and gently, but firmly, pressed from another plate above her breast. The plates flatten the breast and keep it still, which helps produce a better mammogram image. The pressure lasts a few seconds and doesn’t harm the breast. The same steps are repeated with the other breast. The plates of the machine are then tilted to take a side view of each breast. When done, a woman will have had two different x-rays, or views of each breast, for a total of four x-rays. Mammograms are viewed and examined by radiologists who have special training in diagnosing diseases using X-rays. Mammograms are also recommended for women who have symptoms of breast cancer and are younger or who have a risk of its development. A mammogram can take only few seconds to make you aware about the real picture of your suffering. 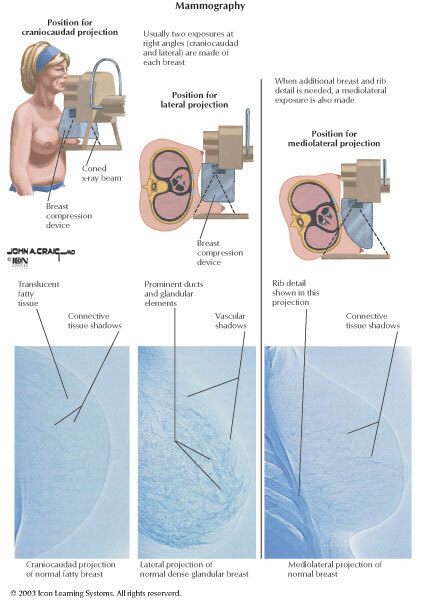 Most women argue that getting a mammogram is uncomfortable, few say that it is painful although the pain is not a longlasting.One experience different comments depending upon the size of their breasts, the skill of a technologist, how much breasts need to be pressed n women’s monthly menstrual cycle. Major injuries and surgeries can affect mammograms. Mammograms are generally used for two main reasons: Diagnosis and Screening. Screening mammograms are used to check those women who have no signs and symptoms of breast cancer and involve two X-rays of each breast. Its goal is to find cancer early if it is there even if t is too small to be felt. Diagnostic mammograms are used when a woman has an abnormal mammogram or have symptoms of breast cancer. Different pictures are taken carefully to study the breast. Sometimes a woman can receive a diagnostic mammogram just after having been screening mammogram and its purpose is to examine any abnormalities found on the first mammogram.